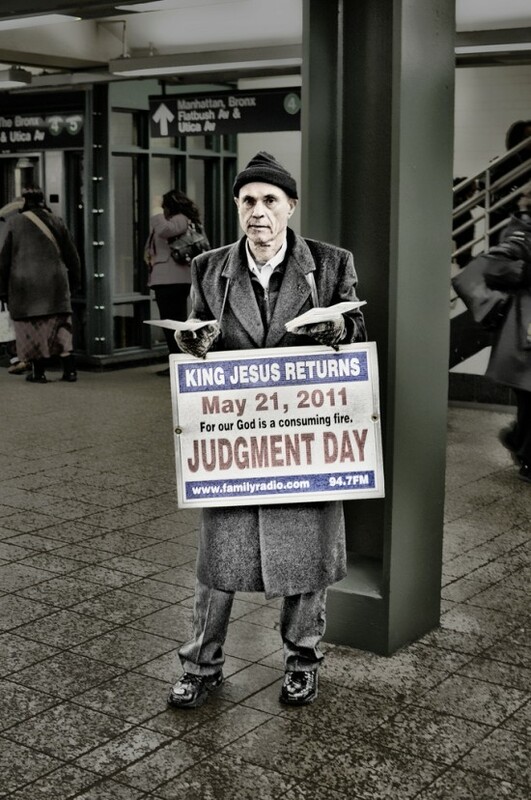 It’s Saturday, May 21, 2011 at about 5:00 central time, and if I finish writing this article, Harold Camping‘s prediction of the rapture taking place right about now will prove to be wrong. I have a really good feeling that this article will be posted and if you’re reading it then obviously the time has passed with no rapture. I’m not really too concerned about writing about why his prediction was wrong. There have been plenty of others who have predicted a date for the end of the world that have come and gone and there no doubt will be plenty more will set future dates. The reason I don’t put too much stock in these predictions is because Jesus told us no one would know when he will return. But there are two things that concern me more about his teaching that I think Christians should be aware of, because they’re easy to miss and it’s more likely that others would teach the same thing. First, he believes that all of the Bible is allegorical, meaning that everything has a hidden spiritual meaning. This is why he feels like he can make predictions about specific dates for the end of the world and say that “the Bible guarantees it.” What’s even worse with his beliefs is that he only interprets Scripture with Scripture. Normally this is a good thing, but when your understanding of what Scripture is is fundamentally flawed you can get it into real trouble as evidenced by his predictions. Second, he believes that we are no longer in the “church age” and that true Christians should not associate themselves with any church. Again, this is an extreme view, but I see it in a lot of people today. They may not have the same theological reasonings as Mr. Camping, but there’s a growing belief that churches are no longer necessary. The other problem with this view is that it’s a slippery slope to go down, and it’s one that Joseph Smith traveled as he began the Church of Jesus Christ and the Latter Day Saints. Being connected to a church allows others to refine your view and help correct you if you’re out of line. Those are just a couple things that come to mind. What do you think? Share in the comments below! I think if the Mavs don’t win tonight, Mark Cuban might try and finance a rapture of his own. With so many people making so many predictions, how did this one get so much press? Okay, I see this group spent $100 million worldwide to publicize it. I was going to say I’ve seen billboards all over the place talking about it. I’m not sure if the “ministry” spent the money or if it was the followers getting rid of all their money/possessions. Great stuff…! Thanks for the mention, I really appreciate it! Thanks Rick! Your post pushed me to write this.